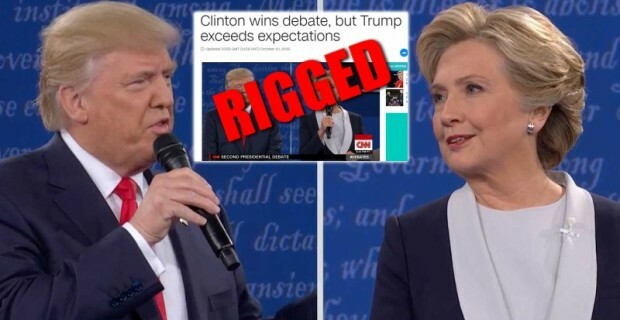 CNN was forced to rig its own poll yet again in order to claim that Hillary Clinton won last night’s debate, despite the overwhelming consensus that Donald Trump scored a clear victory. A CNN/ORC poll of debate watchers released last night, which sampled just 537 respondents, found that 57% thought Clinton won the debate while 34% thought Trump was victorious. However, despite not yet releasing its full methodology, CNN reported that 58% of the respondents were Democrats. This does not mean that 42% were Republicans, since the 42% figure also includes independents. This is not the first time that CNN has pulled this stunt. As we reported after the first presidential debate, CNN’s poll sampled 41% Democrats compared to just 26% Republicans. The fact that even more Democrats were sampled this time is stunning. Recall that 33% of respondents in the previous poll were independents. Even if the number of of independents polled is significantly lower – say 20% – this would still mean that CNN surveyed just 22% Republicans. If you poll a sample group that is heavily in favor of Hillary Clinton before the debate even begins, then obviously the result is going to be skewed in favor of Hillary Clinton. Another YouGov poll, which reported that Clinton won the debate 47%-42%, sampled 41% Democrats compared to 31% Republicans, another clear bias that skewed the result of the poll. If the ratio had been flipped or equal, the outcome would almost certainly have been a Trump victory. The number of participants polled by Lutz who said they were going to switch their vote in favor of Trump after the debate clearly indicates that Trump won the debate.